See here a short film about 2017 fieldwork of the REPEAT team. Many thanks to Stephan Busse for producing the film. 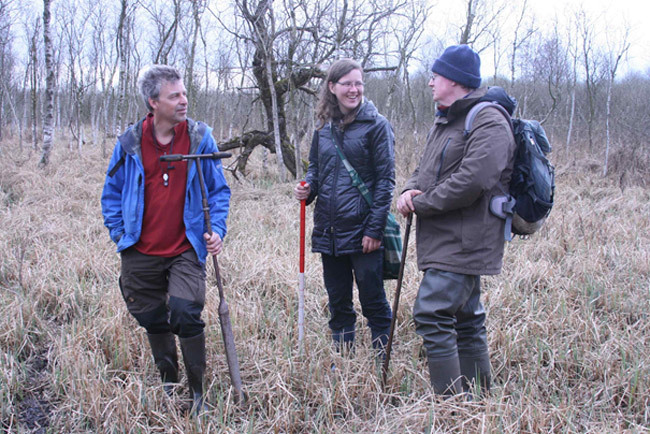 April 2017: Discussing potential study sites in Peene Valley near Anklam (Germany). 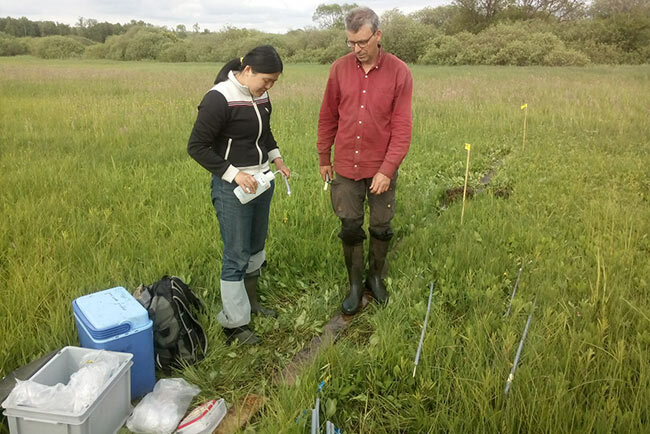 June 2017: Sampling at a rewetted site in Peene Valley near Quilow (Germany). 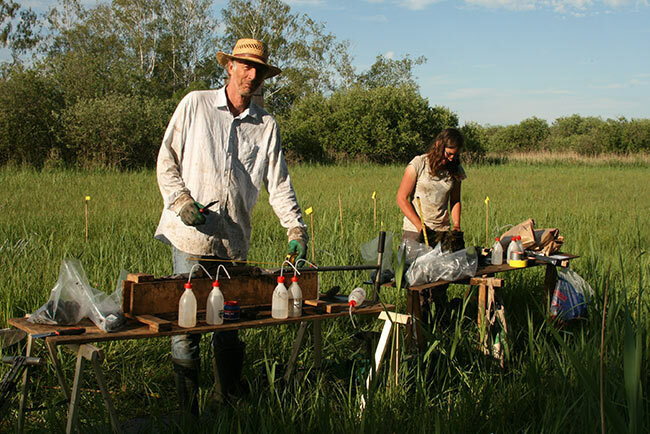 June 2017: Preparing rhizons for taking pore water samples with an intern from Canada in Recknitz Valley (German). Photo: Franziska Tanneberger. 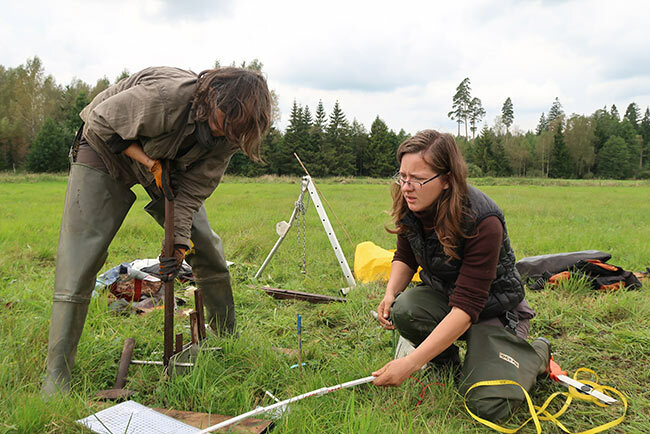 June 2017: Taking soil samples for bulk density, peat decomposability (FTIR), microbial community (PLFA), microbial activity (MSIR) and mesofauna analysis in Peene Valley (Germany). Photo: Franziska Tanneberger. June 2017: Meeting with local farmer in Peene Valley (Germany). 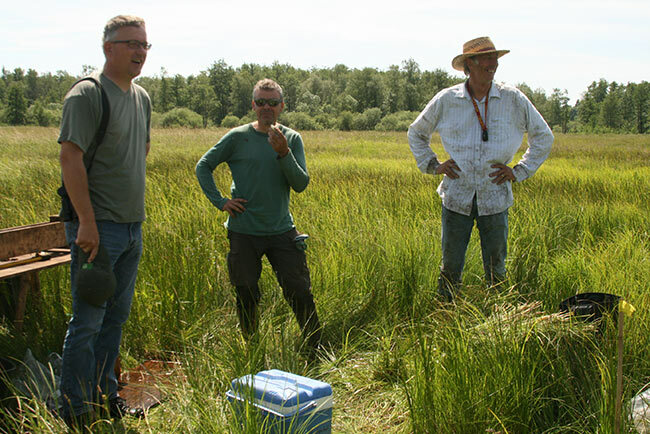 July 2017: Establishing a study site in Danube Delta (Romania). 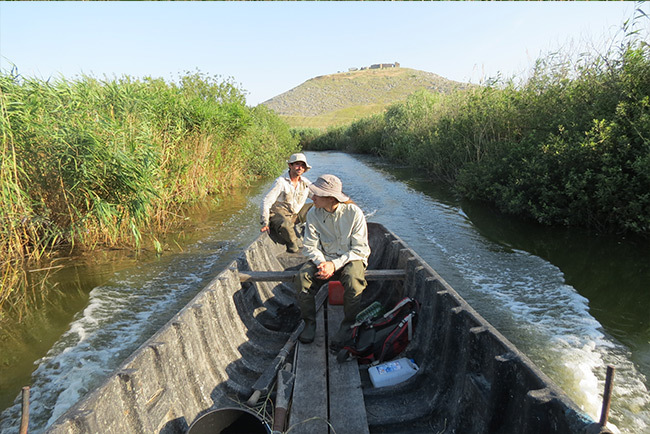 July 2017: Boat trip to REPEAT study sites near Enisala Castle, Danue Delta (Romania). September 2017: Retrieving a study plot and positioning mobile board walks in Rospuda Valley (Poland). 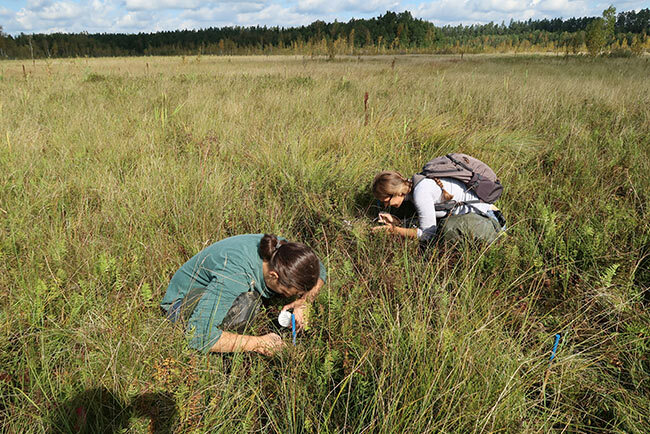 September 2017: Marking mosses with white stains in Rospuda Valley (Poland). 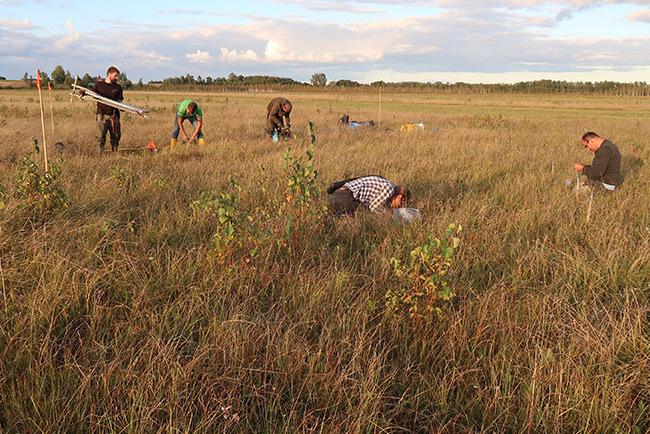 September 2017: Recording vegetation composition before installation of ingrowth cores and litter bag frames at a mowing study plot in Biebrza Valley (Poland). Photo: Franziska Tanneberger. 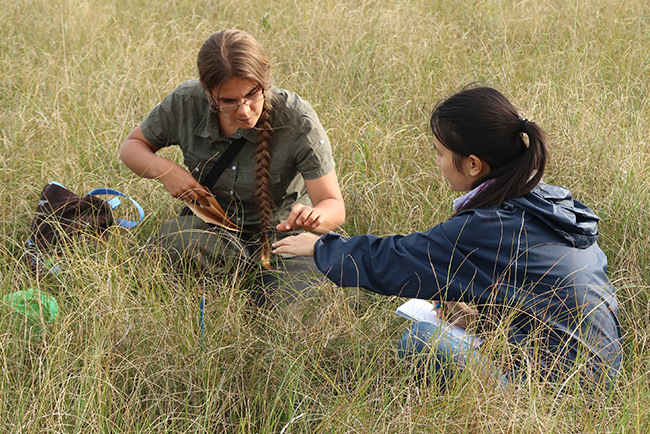 September 2017: Measuring soil density with a penetrologger in a mowing study plot in Biebrza Valley (Poland). Photo: Maika Holzapfel. September 2017: Preparing litter bag frames at night during the field campaign in Poland. 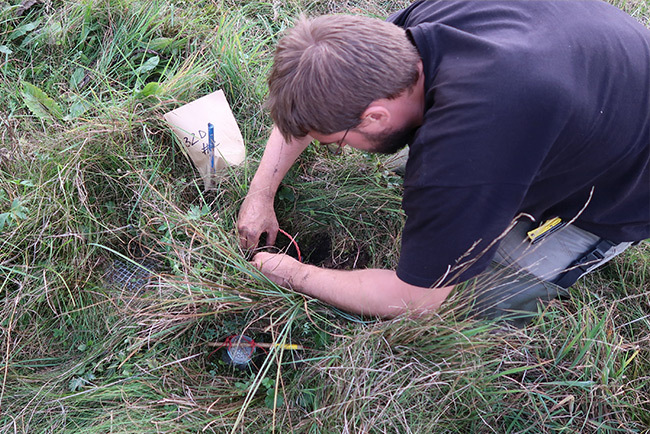 September 2017: Installing ingrowth cores in Rospuda Valley (Poland). 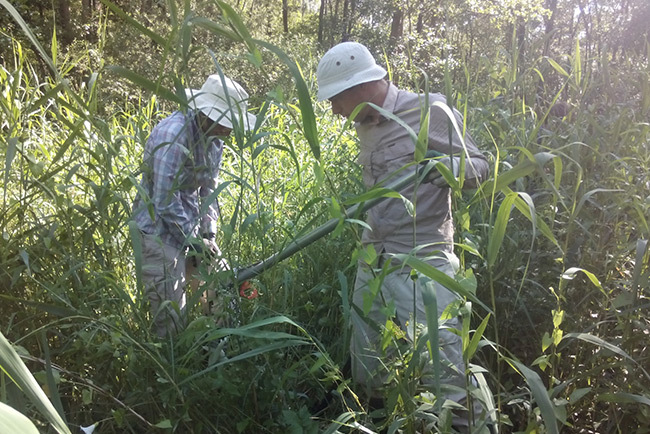 September 2017: Installing litter bag frames in an undrained, unmown site in Biebrza Valley (Poland). 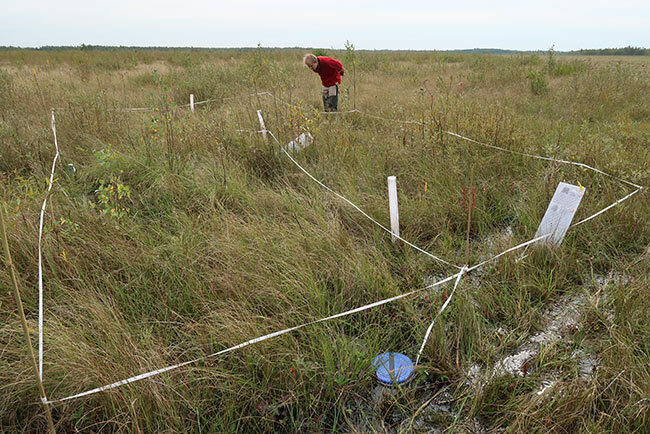 September 2017: Installing litter bag frames and measuring the distances between installations in a drained site in Suwalszczyzna region in Northeastern Poland. Photo: Hanna Silvennoinen. 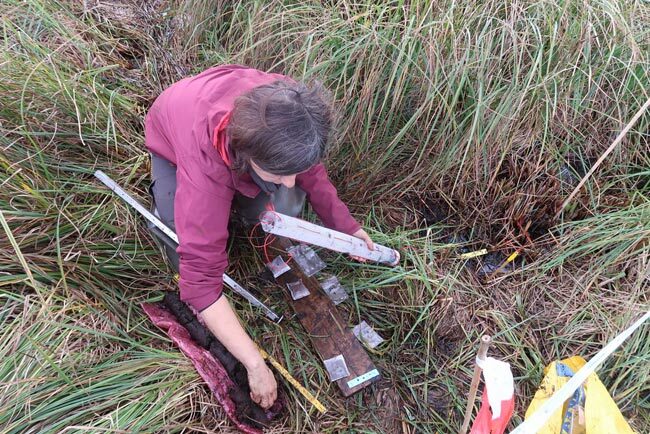 September 2017: Installing ingrowth cores in Danube Delta, Romania. Photo: Jenica Hanganu. 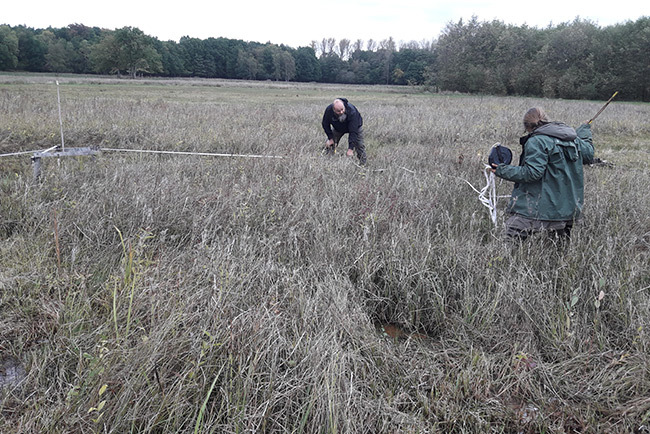 October 2017: Retrieving a study plot at Zwarte Beek, Belgium. Photo: Agata Klimkowska. October 2017: Done! Plot with all installations at Binnenveld, Netherlands. Photo: Agata Klimkowska. 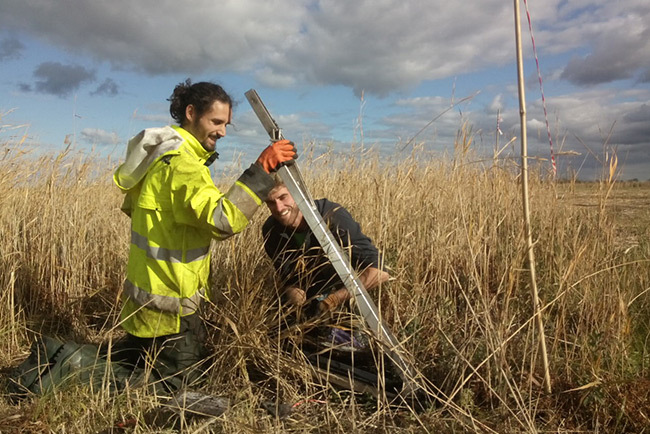 October 2017: Clipping vegetation at Drentse Aa, Netherlands. Photo: Elke Seeber. 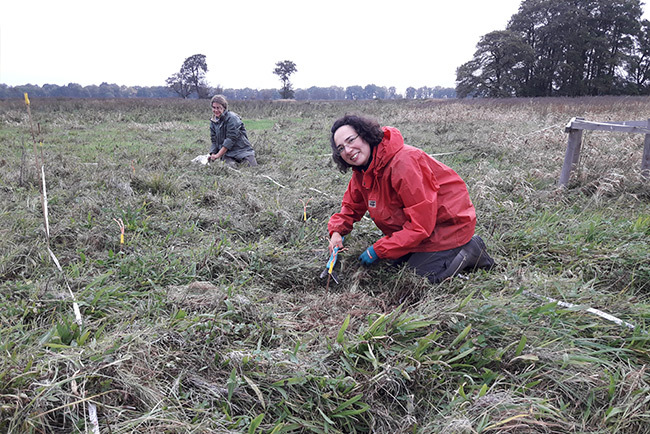 October 2017: Filling cores with local peat and teabags filled with homogenised peat, Trevel Valley, Germany. Photo: Felix Närmann. 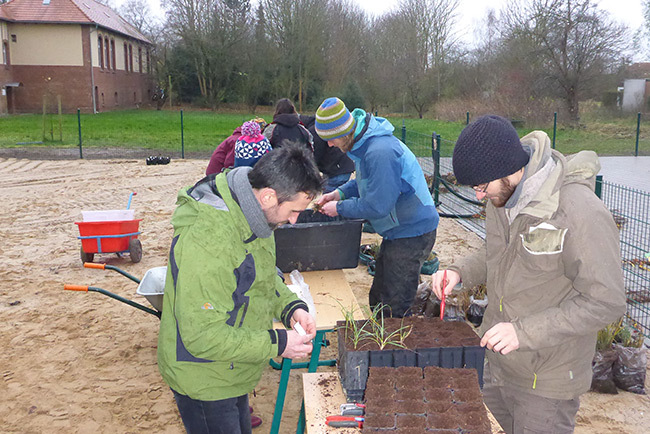 December 2017: Potting plants of six sedge species for the mesocosm experiment in 2018. Photo: Jürgen Kreyling. 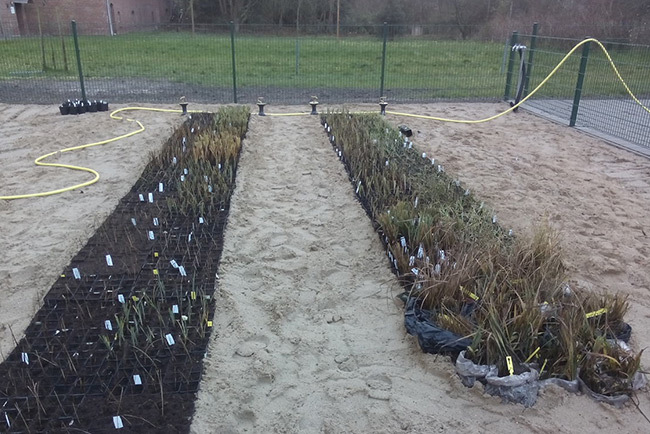 December 2017: Sedges prepared for the mesocosm experiment in 2018, Greifswald University. Photo: Franziska Tanneberger. 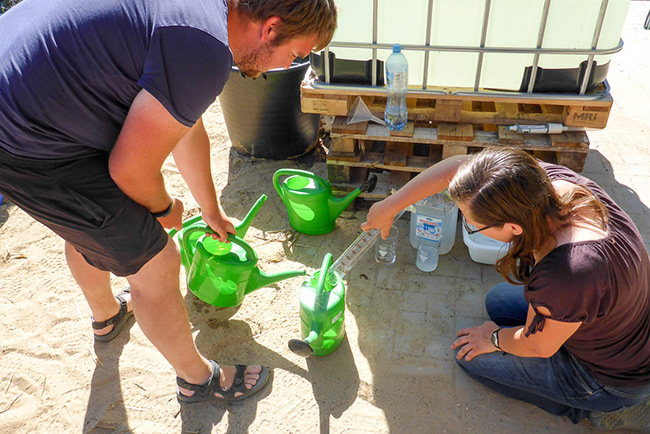 July 2018: Preparing fertiliser for the mesocosm experiment in Greifswald (Germany). Photo: Jürgen Kreyling. 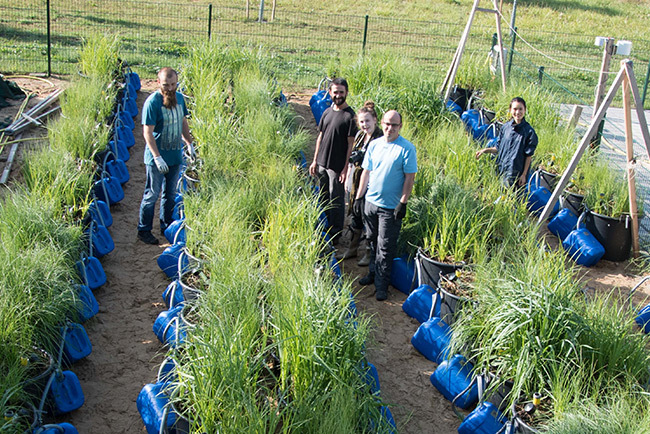 September 2018: Just starting to separate roots, rhizomes and shoots at mesocosm facility in Greifswald (Germany). Photo: Jürgen Kreyling. 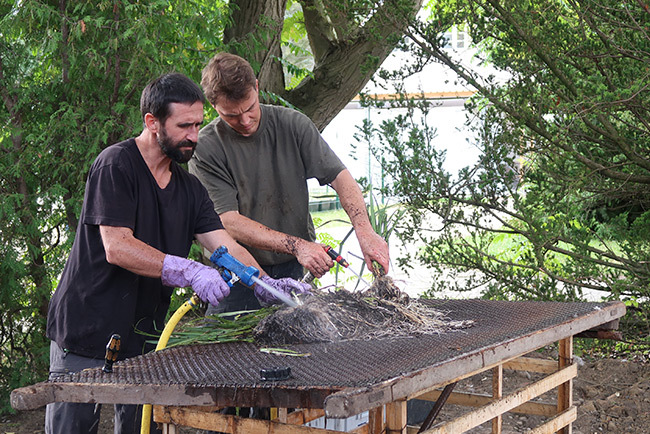 September 2018: Washing roots to analyse below-ground biomass production at the end of mesocosm experiment in Greifswald (Germany). Photo: Franziska Tanneberger. 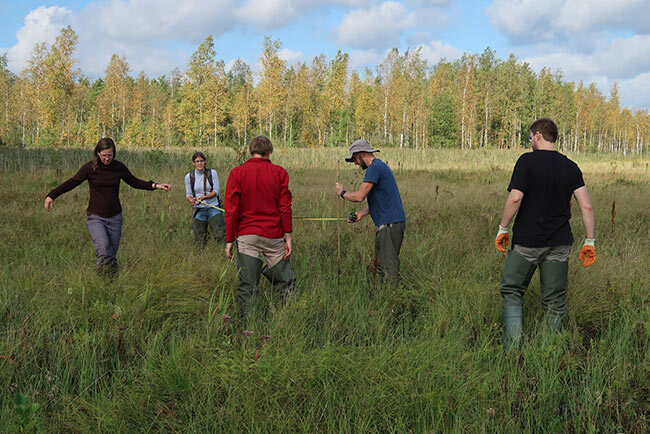 September 2018: Collecting mosses for assessing moss productivity in Biebrza Valley (Poland). Photo: Franziska Tanneberger. 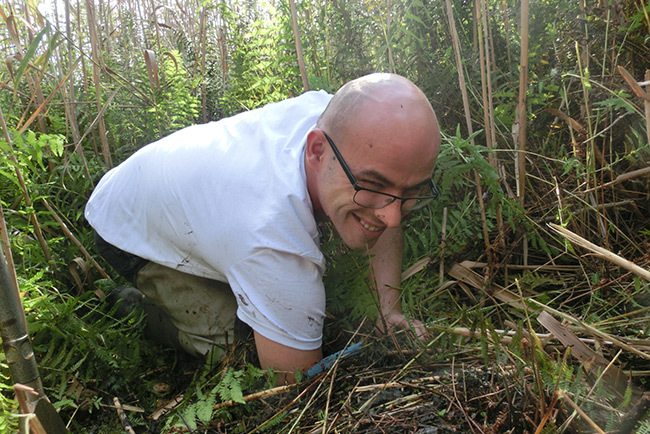 September 2018: Gathering and removing all installations, such as ingrowth cores, above and underground tea and litter bags and moss bags in Biebrza Valley (Poland). Photo: Franziska Tanneberger. 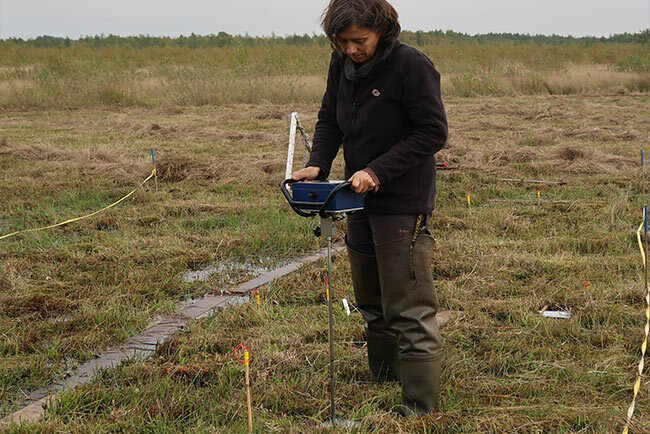 September 2018: Manual extraction of ingrowth cores in very wet and soft peat (Poland). Photo: Franziska Tanneberger. 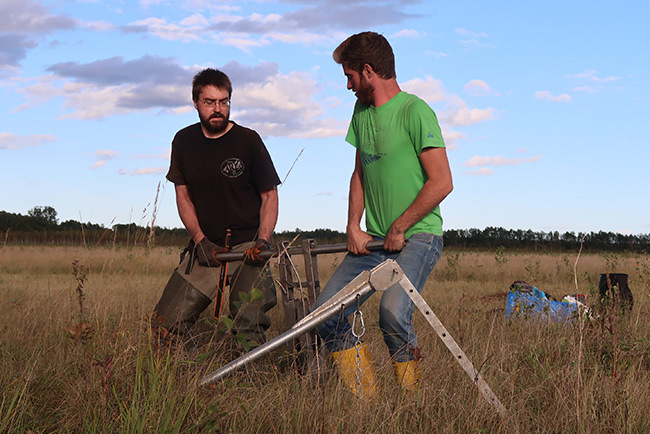 September 2018: Extracting ingrowth cores with a Wardenaar corer in a transect site (Poland). Photo: Franziska Tanneberger. 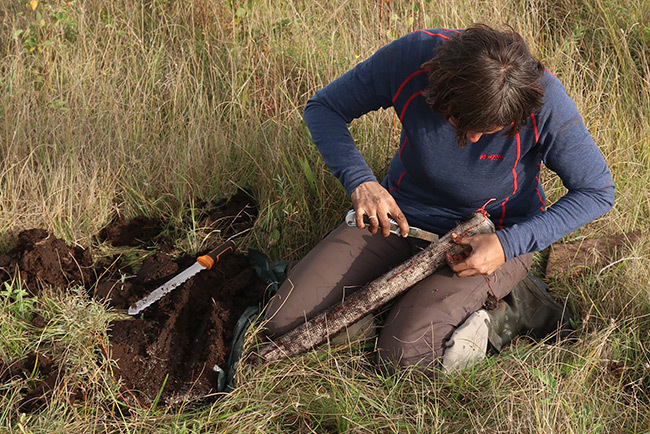 September 2018: Cleaning extracted ingrowth cores with a sharp knife (Poland). Photo: Alexander Piegenschke. September 2018: Team members busy with their tasks in the sunset light, Biebrza Valley (Poland). Photo: Franziska Tanneberger. 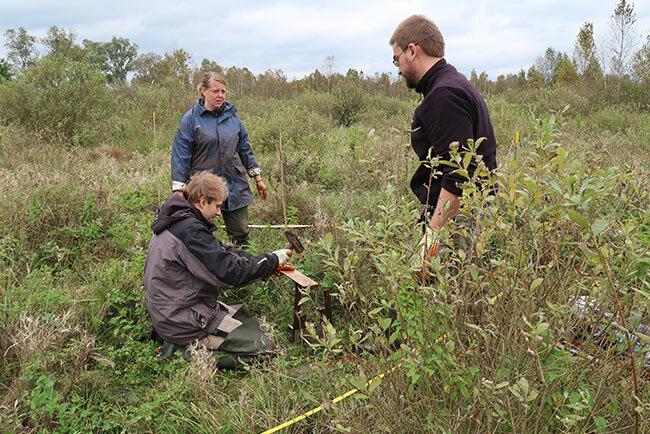 October 2018: Extracting ingrowth cores with a Wardenaar corer in Peene Valley near Anklam (Germany). Photo: Franziska Tanneberger. April 2017: Screening round to potential study sites in Belgium, Netherlands, Germany and Poland by Camiel Aggenbach (Antwerp University) and local partners. 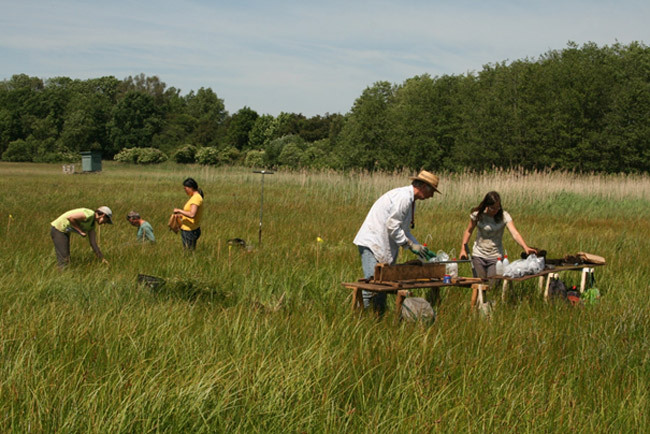 May/June 2017: Sampling campaign by Antwerp and Greifswald universities for site parameters and soil samples to all 39 triplet sites. 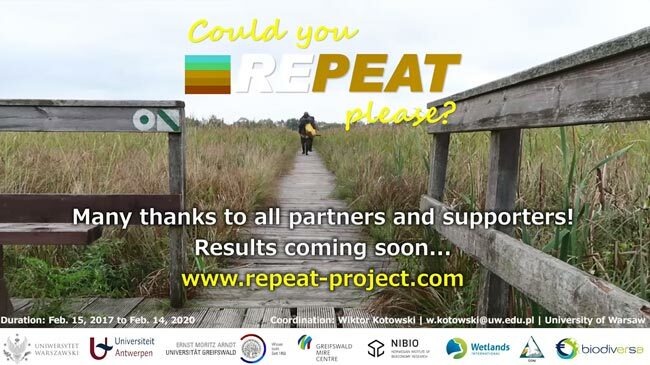 Sampling campaign by Warsaw University at seven trophy transects in Poland. 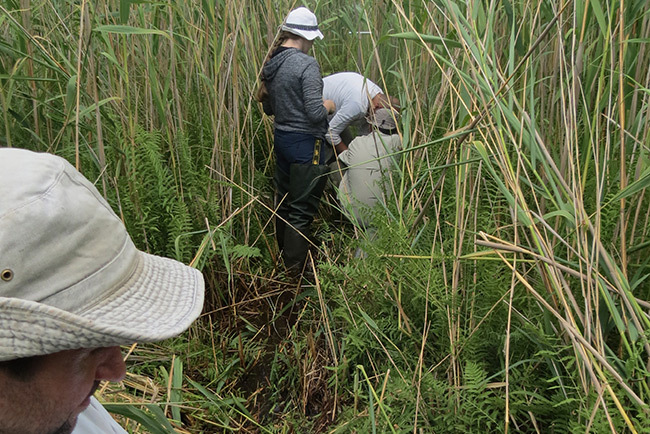 July 2017: A small team from Warsaw University surveys together with the team from Danube Delta Research Institute potential study sites in Danube delta. 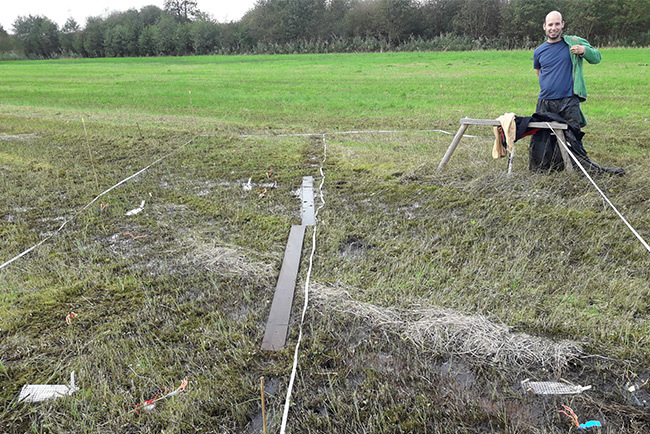 September/October 2017: Installation campaign by Greifswald and Warsaw universities in all 96 study plots in all six countries: 303 ingrowth cores with standard substrate, 303 large (0-50 cm depth) litter bag frames with local root material and standard material (rooibos tea) at three depths, 132 large (0-50 cm) litter bag cores with homogenised local peat, 404 litter bags with standard moss (Calliergonella) biomass, 480 litter bags with local above-ground biomass, painting numerous moss for assessing moss production… and almost 1 km of bamboo sticks for marking the installations!